Set from 1980 unused with gum never hinged. 2018 O/Print sideways in purple Corner Marginal 20T/K600 (Colour Trial) rare U/M. There is heavy duplication in this lot. See Pictures for info. Any problems WILL be an honest mistake and I will be happy to resolve it! Mint lightly hinged. in good condition. (Malawi 2017 Butterflies Overprint (OVPT) - Mint Never Hinged (MNH). Set of 5 values (5v Set): K600 on K1, K900 on K65, K1280 on K2, K1150 on K4, K2000 on K10. You will be back for more! 3) Select each item and 'Add to Basket'. The pages are complete for the period and in nice shape. Malawi MiNr. Motiv: Vögel. Fehlen Ihnen noch Binder von Leuchtturm, Kabe, Lindner oder Safe???. Land: Malawi. Condition :mint,never-hinged(MNH). Date : 1971. Minor corner wear. in good condition. MALAWI 1960-70's. CHRISTMAS, OLYMPICS. COINS, PEACE ALL. TEN DIFFERENT SOUVENIR SHEETS's. 300 DIFFERENT MALAWI ONLY. Unless you ask for a signed for service. 2018 O/Print sideways in purple 20T/K600 (Colour Trial) rare U/M. 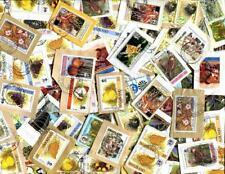 SG 567 - 570 Lightly mounted mint set. Date of issue: 15 February 1966. You think price is not right?. -:- The item you receive may not be the item scanned, but will be of similar quality. No Exclusions. Glauben Sie, dass der Preis ist nicht richtig?. Good variety over many years. Mostly large issues with many high values. Malawi - 1966 Malawi Butterflies. The pages appear complete for the period and are in nice shape. Britisch-Zentralafrika B.C.A. / Nyasaland Mi.-Nr. Marke ungebraucht mit Originalgummi, gute, saubere Erhaltung. :- The item you receive may not be the item scanned, but will be of similar quality. -:-~~~~~-:-. Stanley Gibbons No. : 567-MS571. No Exclusions. Yvert No. : 303-306. 1968 Definitives. SG 310/322 (13 values in blocks of 4, no £2 value). The SG catalogue value of this set is £120. Birds definitive set of 14. 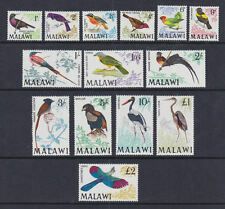 Malawi: 1968 Birds Set of 14 UMM (48). November WM: 1 Perforation: 14¾. Complete Set of 14 1 2. Unmounted Mint.